Japan has always been near the top of my list of places to visit but it has taken me until now to finally make the journey. And since I was planning on a spring visit, I was looking forward to Cherry Blossom Season. The day before I left for Japan I saw a news story that said the cherry blossoms had opened in an explosion of colour, but the video they used must have been from a previous year because when we arrived, while a few buds had opened, the trees were still in their dormant stage. Still we were hopeful that we would get a chance to experience the beauty of the Sakura. After a long 16 hour flight from Toronto to Tokyo, and another hour long wait in line to get through customs and immigration, all I wanted to do was to get to my hotel and sleep. But there were some important things to do first. We immediately headed to the Japan Rail East office in the lower level of Narita airport. If you are planning to take the trains, especially the Shinkansen or bullet train during your trip to Japan, the JR pass is the best deal around. We got an unlimited 7 day pass for about $350 each which is close to the return fare from Tokyo to Hiroshima. But you must book your JR pass BEFORE you arrive in Tokyo, you can’t get one there. They give you a voucher that you have to activate once you arrive in Japan, you don’t have to activate your pass on the same day you go into the office though, you can pick whichever 7 days of your vacation you want to use it. It also works on some of the train lines within Tokyo, like the Yamanote Line that loops around central Tokyo. The Hyperdia website is extremely easy to use to help you plan your rail travel. It has schedules and routes so all you have to do is plug in where you are travelling from and travelling to and the date and time and the search engine will come up with several itinerary choices. A warning though, if you are travelling on the JR pass just be aware that it doesn’t work on the Nozomi Shinkansen (which is the fastest train in Japan) and several regional trains, and if you decide to take any of them you will have to pay extra. A couple of quick notes about the Tokyo subway, even though it is one of the most complex systems I have ever encountered, it works and is not as difficult to understand as you might think. As I mentioned, the JR Yamanote line loops around the city and the JR Chuo line bisects the city (Tokyo station to Shinjuku) and the JR Sobu line runs between Shinjuku and Akihabara. The subway lines are colour coded with a letter (eg. Ginza line is orange with a G) and stations are assigned a number, first station to last. Signs are posted at each subway station showing the previous and the next stop so you can make sure you are going in right direction. Diagrams are also posted at the platform entrance and on the trains showing which compartment is most useful for connections. It’s also a good idea to keep an eye out for the yellow signs when exiting trains to tell you which exit to take for particular buildings. This is very important because some stations like Shinjuku have more than 60 exits which make it pretty easy to get lost. Also make use of the street maps in the subway stations and don’t hesitate to ask the attendants if you are not sure which exit to take or which train to take, 99% of the time they will help you get to where you are going. The Tokyo subway/train map was invaluable for getting around. Google maps also helped, especially using GPS. Tokyo is a very difficult city to manoevre (even taxi drivers get lost); most of the streets have no names except for the main streets, and addresses are determined when the building or home was built so you might get a building 4 next to a building 135. This is probably a good time to mention cellphone/wifi service. Unless you have deep pockets to pay for outrageous roaming fees you will need to get either a sim card or a wifi router. I found that a phone or tablet are mandatory when travelling in Japan, I can’t tell you how many times I used mine. Instead of a sim card, I ordered a wifi router which I had delivered to my hotel, so it was there on my arrival. I investigated several different companies and plans and settled on Japan Wifi Buddy . It was very easy to set up and use, and they even sent along a return envelope so it was easy to just drop it in a mailbox at the airport. I was able to use my iPhone in airplane mode throughout the country, and I had no issues about dropped signal or weak connection. The company also included an extra battery so you don’t lose your connection if you are out somewhere and not able to recharge. Best of all, the price was reasonable. I highly recommend it. And if you are planning to use your phone while in Japan, download some good translator apps. You may be surprised at how little English is spoken in Japan, a lot less than most other countries I have traveled to. That said, the Japanese are the most polite people I have encountered and they will go out of their way to help you, as long as you are able to communicate where you want to go. I had people drop whatever they were doing in order to lead me to my destination; they didn’t just point the way and leave me to my own devices, they made sure that I got to where I needed to go. high end retailer you can imagine has an outlet here and the architecture is spectacular. It was cold and pouring rain but that didn’t stop us from gawking at everything around us, with our mouths hanging open and our cameras clicking. We went to Mitsukoshi Department Store at 10am so we could see the store opening and the staff greeting the crowd of customers gathered outside. We didn’t get to go into a lot of stores on this first day because we couldn’t stick around for long. We had an appointment to meet our tour guides just after noon. We made our way to the Tokyo Metropolitan government offices in Shinjuku to meet our guides. The building is renowned for its top floor observation area, but when we arrived, there was a huge lineup despite the low clouds and pouring rain so instead of waiting to go up to the 45th floor we opted to go to the building cafeteria for lunch, on the 32nd floor. You have to sign up at the security desk and they give you a visitor pass to go up to the Green House cafeteria. When you get up there you are faced with a large selection of plastic displays of food items. Pick out what you want and then head over to the machine where you enter your choices, pay for your food and then receive a ticket which you take to the window serving the food you have chosen and they load you up. Then you simply find a seat with a view and enjoy your lunch. The food was delicious and the view was spectacular. Despite the clouds and rain, we were still able to see for miles and it was wall to wall buildings and homes. It gave us a bird’s eye view of the size of this city. Metropolitan Tokyo is the largest city in the world with close to 35 million people, that is as many people as live in Canada, and they are squeezed into one city. We then headed back down to the lower level and the Tokyo Tourism office to meet our guides. This is something that is unique to Japan, you are able to book a volunteer guide to take you around and show you the sites. There is no fee although you do pay for their transportation and any admission fees to where you are going. We chose Asakusa, one of Tokyo’s oldest districts and renowned for the Shinto Shrine also known as Sanja-Sama (one of the most famous Shinto shrines) and the Senso-ji, a popular Buddhist temple built in the 7th century. It is Tokyo’s oldest temple and the most visited spiritual site in the world with 30 million visitors each year. You approach the temple by first entering through a large “Thunder” gate with a giant paper lantern hanging over it. The lantern is painted in red and black to symbolize clouds of thunder and lightning. You then walk up Nakamise-dori, a covered shopping street that offers visitors a wide range of tourist souvenirs and snacks. There is a large statue and fountain in front of the Senso-ji temple where you are supposed to cleanse yourself. You take one of the cups and pour water onto your left hand, then your right hand, then you take some water in your hand and wash your mouth (don’t drink it), and finally you tilt the cup back so the water washes down the handle and “cleans” it for the next person. When you are finished you place it back on the fountain upside down. and during the Edo period in the 17th century it became the home of Kabuki theatres and a large redlight district. A large part of the area was destroyed during the Second World War. It has since been rebuilt and among the new tourist highlights is the Tokyo Skytree. Our guides were extremely knowledgeable and gave us a running commentary as we walked around the temple site and through the streets, stopping outside a Louch fish restaurant, the oldest in Tokyo. We also visited a lantern shop where traditional Japanese lanterns were being hand painted. We visited Kappabashi street, a one kilometer stretch that contains hundreds of stores targeting the restaurant business and containing a treasure trove of housewares. There were a large number of stores that sell plastic food. It is remarkable how real (and delicious) they look. They are meant for restaurants to display their dishes for non-Japanese speaking customers to indicate what they would like. We noticed some smaller “dishes” on display and it turns out they are covers for your smartphone. I ended up buying some Sake wooden boxes or masu, that are used to drink the traditional Japanese rice wine. I had seen them years before in magazines but have never been able to find them in Canada. They are still in use today and often a glass will be placed inside the box that is filled to overflowing and sometimes people will pour the contents of the glass into the box to drink from. The hinoki wood changes the flavour of the sake and is believed to have antibiotic properties. It is also something that any sake connoisseur must try. After we said goodbye to our guides we decided to continue exploring Tokyo and visited the neighbourhood of Ueno, a short walk from Asakusa. Ueno is home to the Tokyo National Museum, the National Museum of Western Art and the National Museum of Nature and Science. There is also huge park there, Ueno Koen, that features hundreds of Sakura or cherry blossom trees and at night is lit up by hundreds of paper lanterns. Unfortunately it was still too early in the season and there were only a couple of trees that were starting to bloom but those trees drew in the crowds with their cameras. We managed to take some great photos though and it was nice to see some greenspace after being in the midst of so much concrete earlier in the day. When we left the park it was starting to get dark out and that’s when the streets light up. We wandered through the side streets that were packed with food shops, clothing and souvenir stores as well as Pachinko parlours. When it was finally time to call it a day we had to figure out how to get back to our hotel in Ginza. As we stood there studying the big map on the wall of the train station, two school girls came by. We asked them how to get to Ginza. They spoke no English but used their phones to translate for us and they told us to follow them and they would get us where we needed to go. They took us from the train station to the subway station which was about a 15 to 20 minute walk away and then pointed out the Ginza subway line. They did it all with a smile and a bow. We offered to give them some money for their troubles but they would have none of it. They did it simply out of the goodness of their hearts. This was one of our first experiences at the generosity of the Japanese people. so had to make do with walking around the perimeter and enjoying the grounds and the moat. Very beautiful and relaxing and there were a large number of joggers and runners making their way around the perimeter of the Palace grounds. We stopped off at Tokyo Station and the JR Office to reserve seats for the bullet trains we were planning to take. A note of caution, don’t leave it for the last minute, book as soon as they allow you to because the seats go fast. But even if they say reserved seats are not available you can usually try your luck in one of the non-reserved cars. From there we headed to Harajuku, the neighbourhood made famous for all the teenagers who set fashion trends around the world. It was jam packed with people all doing the same thing we were, people watching and window shopping. There was lots to see, especially along Takeshita Dori, the teen fashion market and along Omotesando Dori, a higher end fashion street for those a little older. The guide books said the place was pretty quiet during the week but gets busy on the weekend, although I can’t imagine how much busier it can get. We stopped at a small place for something to eat and had some ramen that was okay, not great. We walked around for a few hours and finally the flu got the better of me and we had to go back to the hotel before I dropped. birds are displayed at the children’s memorial in the Peace Park which was erected to comfort the spirits of the children who died and to symbolize the dream for a peaceful future. Unfortunately we didn’t have time to do much else in Hiroshima. I had hoped to be able to visit Mijima Island where there is a famous Torii gate in the water. But the next day we packed up and moved on to our next stop, Kyoto. Kyoto is definitely my favourite city in Japan. If Tokyo is the future, then Kyoto represents its past. While it is smaller than Tokyo it is the former imperial capital of Japan but still has enough cutting edge architecture to make it a world class city in the 21st century. When we arrived at the train station we visited the tourist office to pick up a bus and subway pass. We also got a great transit map that was invaluable in the city since there are only 2 subway lines so you have to take buses if you plan to use public transit to tour the city. We took a bus to our hotel, with our luggage, crammed in like sardines. When we got to our stop at Kyoto City Hall we didn’t know which way to go, so we stopped a young couple and asked for their help. I don’t know what they teach Japanese kids in school but they are the most polite and helpful I have encountered anywhere in the world. They told us to follow them as they led us to Teramachi Dori, the covered arcade like street that our hotel was on. I can’t believe more cities, especially in Canada, haven’t created similar covered pedestrian streets lined with shops and restaurants, it is really remarkable to see. Luckily I knew exactly where to go once we got on the street thanks to Google Streetview which showed me the stores and restaurants around the hotel, so I knew what I was looking for. It was in a perfect location, with everything you could want right outside your door. The first stop on our agenda was the Arashiyama Bamboo Grove and the nearby monkey park. 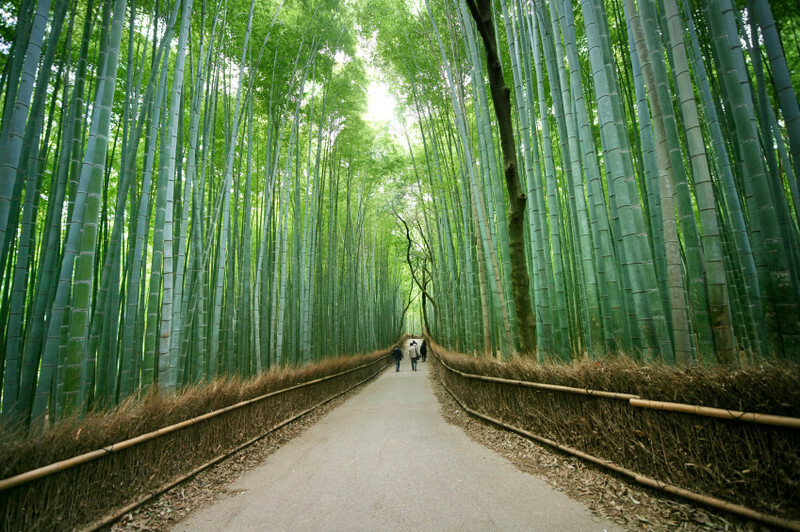 I have seen so many photos of the Bamboo Grove that it was bound to disappoint, especially since there were so many people crowding the pathway. I had expected a contemplative walk through nature but instead was busy trying to maneuver through the crowds. Still, it is beautiful and not to be missed and here’s a link to a photo showing how it is supposed to look. As you make your way through the neighbourhood between the grove and the monkey park, the street has developed into one long tourist hotspot with more souvenir shops than I care to remember. When you reach the river, you make your way across the bridge which has the feel of a mountain village. Wide open spaces, hills and trees replace the shops and tourists. Make sure you have your good walking shoes on for the next part of the journey though, it is an uphill hike to the Monkey Park. While normally I would consider it a good workout, as I was still recovering from the flu it was almost an impossible ascent. I had to rest a few times along the way to catch my breath and continue the journey. But there are people of all ages making the same trek so it is doable and it is well worth the climb. There are hundreds of macaque monkeys roaming freely at the research station. If you have a fear of wild animals, you can go inside an enclosure that is more of a cage for the humans with the monkeys on the outside. You are warned not to feed the monkeys or even show them food, don’t look them in the eye, don’t crouch down, don’t aim your camera directly at them. But when you get up there, the researchers are giving the monkeys food to pose for the tourists, and while we saw a few fights between them for a morsel of food they were fairly well behaved, considering they are wild, although used to the crowds of tourists every day. The views of Kyoto from this site are spectacular with the city laid out before you. Another highlight in Kyoto is the Fushimi Inari-Taisha, an arcade of thousands of torii gates along the path up a mountain. The torii gates are sponsored by individuals and companies which accounts for the large number of them. Again they are beautiful to see but the huge crowds of people take away some of the magic. You can make your way up the mountain through the arcade, which will take about 30 minutes, or you can stop at various points along the way. It started to rain when we were only about a quarter of the way up, so we decided to head back down and it was a good thing too, because the skies opened up. We made our way to Nijo-jo Castle, the historic wooden castle with lush gardens in the centre of the city. We had hoped to get out of the rain and enjoy some of Japan’s history. It was an interesting visit and for me the highlight is the nightingale floors. They have been designed so that when someone walks across them they squeak with a chirping sound like that of a nightingale. The sound was meant to warn the castle security about any possible intruders. We didn’t get to see Kinkaku-ji, the golden temple which is covered in gold leaf or the neighbourhood of Gion, which is home to many geishas. Both were high on my list, but the pouring rain and the flu made it too difficult to include. Instead we went back to Teramachi Dori near our hotel, where we did some shopping and found an old family sushi restaurant where we had a delicious lunch. I checked the weather for our next destination that we were scheduled to visit the next day to try to get a look at Mount Fuji. But when I saw the temperature was -1c with a high of only 4c with rain and wet snow I decided to cancel. We would have been travelling for several hours and would have to change trains at least four times and because of the rain and clouds we were not likely to be able to see the iconic mountain anyway. I checked with our hotel in Kyoto about staying an extra night, but there was a festival the next day and they only had a couple of smoking rooms available and the price would have been about $400/ night. Sorry I wasn’t about to pay that much for a room that smelled of stale smoke. I checked with the hotel we were going to on Sunday in Kawasaki and they were able to give us the extra night and at a great rate. Coincidentally the Kawasaki Hotel Mid is just off another covered pedestrian street. If you are at all budget conscious, you should consider staying in Kawasaki, a suburb of Tokyo. You are still close to everything and the price is half to a third what you would spend for a comparable room in central Tokyo. It’s also very close to Haneda airport where we would be departing from on Tuesday. The area we were staying was a few blocks from the train station. It was convenient and only a 10 minute train ride to central Tokyo… unless you get on the wrong train which we did on our last day and ended up in the suburbs, about an hour outside Tokyo. We were there to attend a unique festival called the Kanamara Matsuri. It turned out that a former work mate of mine was visiting Tokyo at the same time, so we met up with her one evening in Shinjuku. Dazzled by the neon lights and all the action, and we found a great Shabu Shabu restaurant. I was tempted to check out one of the infamous Robot Restaurants, but the prices were too high for something I thought would be pretty cheesy. We also passed by some of the Love Hotels. Apparently Japanese don’t have a lot of privacy so Love Hotels opened up to give a lovers chance to spend an hour or two in private and not worry about being interrupted or overheard. On our last day we made a visit to the world famous Tsukiji Fish Market. People begin lining up outside the market at 4am for a chance to be in the gallery for the daily Bluefin Tuna Auction. We were not about to do that, but we did go early enough in the day to enjoy the fishermen’s labours, some of the freshest seafood you will ever experience. The market is set to shut down at the end of 2017 to make way for a development for the 2020 Olympics. The market will be moved to a new location and it’s not clear if it will still be open to the public. In any case the food vendors that have sprung up around the perimeter of the market will remain, which is a very good thing. The food is amazing and not to be missed. You will never have sushi fresher than what you can sample at one of the vendors. We also revisited Ginza for some last minute shopping. We stopped at the Uniqlo flagship store, 12 floors of Uniqlo fashions. I also made sure that we were able to check out the Dover Street Market, Rei Kawakubo’s high end department store featuring her Comme des Garcons designs as well as many others. It was awe inspiring, and even the store staff was dressed in the cutting edge clothing. It was the perfect way to wrap up our brief but action packed visit to Japan. I can’t talk about Japan without mentioning their… um.. toilets. While there are still squat toilets in many public washrooms, most also have high tech toilets for use. And in hotels and homes the better the hotel, the more sophisticated the toilet. I have never seen anything like them anywhere in the world. The seats are heated, and you can use the different water sprays to clean you, front and/or back. You can adjust the power of the spray as well. Some offer a button to turn on white noise (like a waterfall) and you can adjust the audio level, so you can’t be heard while doing your business. The toilet in one of our hotel rooms had a basin at the back of it, so you can wash your hands and the water is then used to flush the toilet. As you can tell, I spent a lot of time trying out all the features, unfortunately I didn’t bring my camera into the bathroom with me so you will have to check out the images that others have taken online. I had heard about the toilets before but didn’t realize that they are not just a novelty but are in use everywhere. Sometimes you have the perfect vacation. The weather cooperates, you get to see and do everything you planned. And other times no matter how you much you plan, things don’t quite go as you hope. That was this trip. It’s not that it wasn’t a great vacation, I finally got to see and experience Japan. And while I had hoped to see the famous cherry blossoms on this trip, the wet, cold temperatures kept them from blooming. However we did see some blossoms and on the last day as we headed to the airport we saw a lot more as they were opening up. (I discovered much later that the cherry blossoms peak in Tokyo on April 7th, give or take a few days and we left on the 4th.) We knew it was a gamble and sometimes you win and sometimes you lose. It just give me a new excuse to go back one day, there’s still so much to see and do throughout Japan, that next time I will make sure to plan for a longer visit.